Left, The roof plate (with side panel removed) stuffed with straw. As this is in a 18mm wooden box, this straw doesn't need to be dipped in clay slip to be withing fire regs. In this page I examine some alternative methods of insulation and reveal my mixed success. Insulation - the nuclear question. 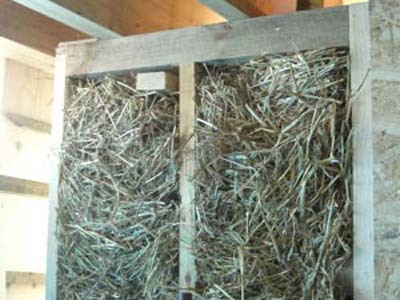 To use straw as loosefill insulation or not? Manufacturers of these highly efficient industrially produced insulators talk with extremely forked tongues on their websites when they describe their products as eco-friendly. They reason that because they have a beneficial effect on carbon emissions they can call these products eco-friendly no matter how they are made. On the other hand the lovely products made from plants and wool genuinely are eco-products because of BOTH the way they are made AND the insulating effects they have. Insulating with straw does have some downsides. So here, humbly, I admit that next time I may be using the evil chemical products as they may save me, personally, a lot of time and effort. Now, finally, I believe their green hype. Using straw as loosefill insulation in both ceiling and floor has cost me a lot. Not in material costs, but in time and hassle. Having used straw in my ceiling the nice building regs man told me I'd have to install plasterboard to bring it into fire regs. This cost me loads of time and money. Stuffing the ceiling with straw had taken weeks anyway. To prevent the straw in the ceiling becoming damp an air gap must be left, this required boxing the straw both above and below. I have a nagging doubt about that straw in the roof and the top wall plates... What is going on in there? Who has moved in with it? Straw-clay. Takes twice as long. 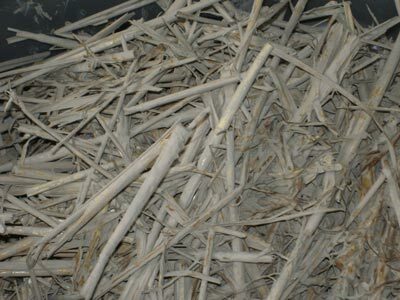 Straw bales, due to their density, are very resistant to fire, however loose straw will burn. This is why loosefill straw insulation needs to be boxed in to fulfill fire regs. An alternative is to coat it all in a clay slip. This makes it very hard to burn. However it takes approximately twice as long to install. After a few hours of doing this I just gave up. been soaked in a clay slip. Peter Beresford, the structural engineer, suggested I find out how much the clay slip will add to the weight of the straw, which, of course, is a light material. Here are the results of a simple test. I think I will repeat this test again, just to be scientific, but for the moment it is a reasonable guide to the relative weights of the materials. The weight is approximately 5 times the original weight of the straw when wet, i.e. during installation. 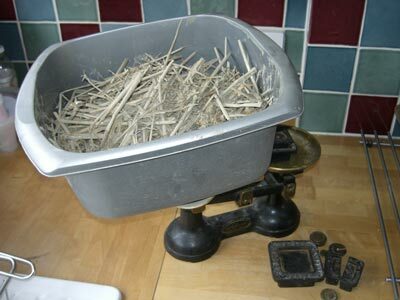 Once dried the final weight is approximately double the original weight of the straw. What I'd do different next time. If I build another I will insulate the ceiling using some kind of blown foam which I will put on the outside under the rubber membrane. I'll be able to install this in a matter of minutes rather than weeks. Low cost DIY pipe insulation. Hey, stop popping all those bubbles in bubble wrap and re-use it as pipe insulation instead! 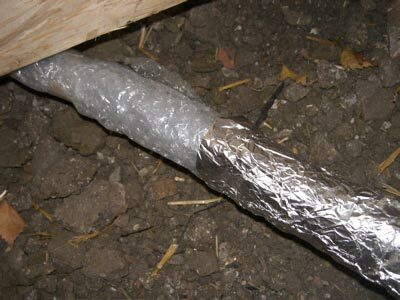 They are selling bubble/foil pipe insulation in B&Q for a ridiculous price so I thought I'd attempt a DIY version using old packaging and some silver foil. I made my bubbles double thickness so hopefully its even more effective than the shop stuff. My only fear is that it may be attractive to rodents, but surely no more or less than conventional pipe insulation. NOTE. I was right about pests finding this stuff attractive, not rodents, but a fox got under the building and removed ALL the pipe insulation to build a nest! Would the fox have shredded ordinary foam insulation? I have no way of knowing. Now the pipe is uninsulated.